You're going to get out in the great outdoors this morning on a tour of Banff. There are so many scenic highlights here, and we're going to fit in as many as possible. You'll see the Hoodoos of Bow Valley, imposing spires of rock carved by the forces of nature which stand guard over the Bow River, and Surprise Corner. As the name suggests, sensational picture-postcard views are waiting for you here, so remember to bring your camera! At times the Banff-Jasper Highway reaches nearly 7,000ft above sea level, and the mountain ranges flanking it soar to more than 11,000ft. 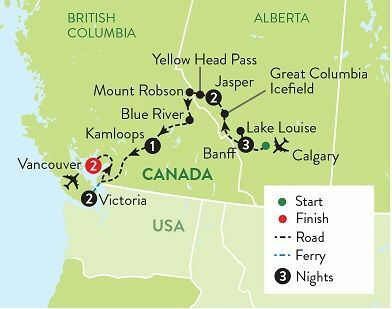 We're going to travel along this iconic route on our way to Jasper, our next base. A former railroad town, Jasper is now known for its breathtakingly beautiful national park. You're going to discover its incredible highlights today, in particular the spectacular Maligne Lake, renowned for its azure waters, and Maligne Canyon. The ferry terminal is where we're headed this morning on a journey which takes us once again through the rugged scenery of the Rocky Mountains. Our ferry will take us to Vancouver Island and then we'll travel by road to Victoria, the provincial capital of British Columbia. This is our base for the next two nights, and we'll get our bearings right away with a sightseeing tour on arrival. Soak up Victoria's old-world charm as you explore at leisure today. Highlights include the fabled Empress Hotel, which overlooks the picturesque inland harbour. Vancouver is yours to explore as you please today. If you'd like to join an optional excursion, come with us to Vancouver's North Shore. Here you'll see the spectacular Capilano Suspension Bridge and take a cable-car ride up Grouse Mountain. On a clear day the views of the city, the snow-capped mountains of Washington State and Vancouver Island are just wonderful. Spectacular Rockies and Vancouver add on - extend your holiday to 14 days from £124 pp. May 2019 - October 2020 departures. Canada’s awe-inspiring Rocky Mountains, glaciers and vast canyons provide the perfect backdrop for this fascinating new tour from Travelsphere. The tour also gives you the chance to discover picture-perfect Lake Louise and the beautiful Maligne Lake and Maligne Canyon. Cultivate your adventurous side with opportunities to try river rafting and immerse yourself in Canada’s unique wildlife on an incredible Rockies River Safari. Mount Royal Hotel Banff Perfectly situated downtown in the very heart of Banff and overlooking the mountains, this historic hotel is in a redbrick building dating to 1908. Warm, relaxed rooms and suites have free WiFi, air conditioning, flat-screen TVs and sitting areas. Dining options include a Canadian restaurant with communal tables, a rib shack, and a cozy lounge with a fireplace. There's also a hot tub and a sauna. Sandman Signature Kamloops Hotel This contemporary hotel is a minute's walk from Kamloops Heritage Railway, a 3-minute walk from the Interior Savings Centre and a 12-minute walk from Sacred Heart Cathedral. The airy rooms feature free Wi-Fi and 39-inch flat-screen TVs, plus minifridges, microwaves and work desks with ergonomic chairs. Amenities include a trendy sports bar with an outdoor patio as well as an indoor pool and fitness centre. The 4-star Best Western Carlton Plaza is situated in downtown Victoria. Hotel facilities include a restuarant and a gym. Bedrooms have private facilities, air-conditioning, safe, hairdryer, complimentary wi-fi, tea/coffee-making facilities and a TV. Holiday Inn and Suites Vancouver Downtown A 7-minute walk from shopping on Robson Street, this modern hotel is also a 10-minute walk from the Hornby Street Aquabus, which offers direct access to Granville Island. Subdued rooms come with flat-screen TVs and desks, plus minifridges and coffeemakers. The facility also offers a casual restaurant/lounge, an indoor heated pool and a 24-hour exercise room, plus a spa.